"Listen to me, you kids--you are not going on a normal hunting trip..."
Good news--if you’ve ever wondered what it would look like if Rambo ever headed to Mexico to carve up witless vacationers with Freddy Krueger-inspired gear, then Hell’s Trap will provide the answer. It won’t exactly be the most entertaining response to a question that no one’s ever asked (besides yours truly), but it’s a goofy bit of fun hailing from south of the border. 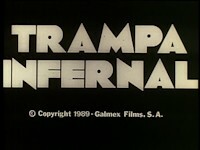 Typically, getting caught in a hellish trap down in Mexico involves bad water and a case of Montezuma’s Revenge, but, in this case, it means you’re stuck with awesome perm-mullets, mustaches, and a bunch of dead idiots. Of course, said idiots start out as live idiots. Two of them in particular are a couple of competitive guys who take paintball way too seriously; however, to up the ante, they decide to engage in a real man’s competition: bear hunting. Apparently, a rouge bear has been chewing up nearby tourists, so the two head out to see who can kill the beast first. With their buddies and girlfriends in tow, they head out to the woods, only to discover that there’s no homicidal bear lurking; instead, a maniacal, razor-gloved Vietnam vet has taken refuge and has a penchant for killing anyone who intrudes. Though the film’s villain wears a familiar looking razor glove, Hell’s Trap takes its cue from stuff like Friday the 13th, as it’s a quick, 75 minute jaunt into the woods that eventually ends with a pile of mutilated corpses. It’s not a particularly great one, but Galindo does manage to nicely photograph the eerie, woodsy surroundings. As far as this stuff goes, it’s a slight bit of a slow burn that hits all of the usual points, such as spooked locals and the discovery of human remains before the baddie shows up. The typical undercurrent of slasher silliness is on display, too, as the cast of characters are especially absurd. Our hero is Nacho (he of the spectacularly permy-mullet), who has the requisite fat, goofball buddy and a doting girlfriend. His antagonist is an arrogant and stupid sort, and he also has an assistant and a girlfriend who fortunately round out the body count. These guys are uber-confident and ooze machismo--they don’t even blink an eye when a local arms dealer (!) insists they’ll need a machine gun for their trip. Nothing says “you’re doomed” like refusing to take semi-automatic weapons on a vacation to the woods. Then again, this might have been an even shorter movie had they heeded such advice. We also would have missed out on some fairly decent bloodletting. 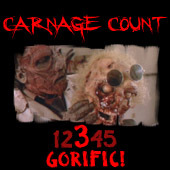 While you won’t find any outlandish gore displays, the deaths are effectively grisly. Obviously, the killer gets some mileage out of his Freddy glove, which he uses to slash his victims across the face and throat. The villain is somewhat interesting, as he also wears a mime mask that’s somewhat reminiscent of Michael Myers (for whatever reason, he inexplicably removes it in a climactic scene, seemingly only to yell at the camera). A long-haired, shaggy woodsman, he’s a survivalist that’s rigged the woods full of traps; he also growls a lot, so I can totally see how locals have mistaken him for a bear. The only apparent reason for his bloodlust is that Vietnam drove him crazy, but when did you ever need an elaborate excuse to kill a bunch of amateur actors on-screen? Luckily, the body count is robust enough, plus it takes a different turn than most slasher climaxes; instead of having a nubile, scantily-clad girl running from the psychopath, this one devolves into a shoot-em-up survival/action flick that’s probably a little bit more sluggish than it should be. Getting to that point is enjoyable and brisk enough, but you won’t find much here that you haven’t seen before. Had Hell’s Trap not featured a maniac wearing a murder implement reminiscent of the Springwood Slasher, it likely would have never landed on my radar. I don’t regret that it did, for what it’s worth (if anything, it put another Mexican horror notch on my belt). To check it out, track down volume one of BCI’s “Horror from South of the Border” collection, where you’ll find it with five other movies, including the infamous Don’t Panic. Hell’s Trap looks and sounds fine considering the budget pack origins--certainly a step above VHS, but not quite fully remastered, the transfer is crisp and vibrant, while the sound is clear. Unfortunately, this set isn’t as much of a bargain as it used to be, as it’s gone out of print; you’ll likely have to pay close to 20 bucks for it, which still isn’t bad for six movies. Cautious viewers might want to wait and see if this pops up on Netflix, even if it is likely the best Mexican re-imagining of First Blood as a slasher flick you’ll ever see. Rent it!